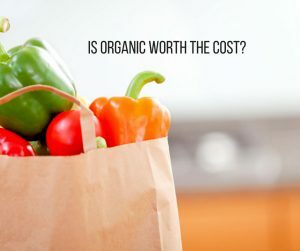 Home » Uncategorized » Organic Food – Is it Worth the Cost? This entry was posted in Uncategorized on September 9, 2018 by dk. How would you describe “organic food” quickly in three words or less? Good for you? Or expensive? Neither is a wrong answer. We often hear in broad terms about how organic food is good for you and good for the environment. And, although we want to do the right thing for our bodies and our planet, the premium prices hardly seem fair. Walk into any grocery store, and you’ll see how organic food is priced significantly higher than conventional produce. Sometimes nearly double! So, why is that? 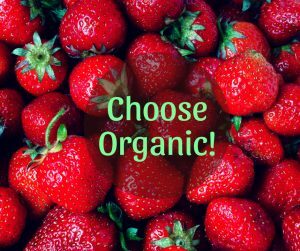 Unlike conventional farming, which uses synthetic fertilizers to boost crops with an instant punch of nutrients, organic foods are fertilized by organic matter. The difference is that compost and animal manure slowly build the soil, releasing their nutrients naturally over time. This slow and steady approach generally means that an organic crop will yield approximately 20% fewer crops than their conventional competitors. So what’s a health and eco-conscious shopper to do? Do you buy into the hype without really knowing, or is the difference truly worth it? According to a new study in Nature Plants, yes, it’s worth it! Support social well-being with meaningful interactions between farmers and consumers. These are all great reasons to make a difference with your dollars by supporting the organic food movement. But chances are you’re still wondering…. How does organic food actually benefit me? Organic food has more vitamins and minerals. Without the use of pesticides, organic fruits and vegetables must fend for themselves. They do so by producing more of their own antioxidants to guard against harm. Studies show that organic foods contain 18 – 69% more antioxidants than conventionally grown crops. 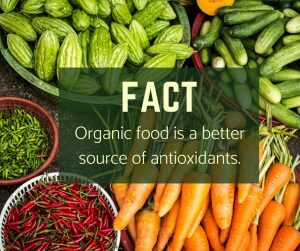 This means that organic eaters consume nearly twice as many cancer-fighting, age-reversing, immune-boosting antioxidants every day! In addition to those awesome antioxidants, one study also shows that organic foods have higher levels of vitamin C, iron, phosphorus, and magnesium than conventionally raised crops. Meanwhile, remember those synthetic fertilizers I mentioned earlier? Well, they get that big boost of energy via high levels of nitrogen. This causes conventionally grown crops to have higher levels of sugars and starches as opposed to the protective antioxidants found in organic foods. So, which would you rather be eating? Organic food is less toxic than conventionally grown crops. It’s probably something we all assume when we think of “organic,” but it’s good to know that there is scientific proof backing that assumption. A meta-analysis of 343 peer-reviewed studies conducted by the British Journal of Nutrition found that conventional crops have higher levels of the toxic metal cadmium and as well as pesticide residues. As you may have heard, researchers also found an increased cancer risk in children near California strawberry farms that use pesticides. And in recent news the large agricultural corporation, Monsanto which manufactures a well-known pesticide, just lost a lawsuit with a cancer patient, and now owe him $289 million dollars. He simply applied Monsanto’s weed killer pesticide regularly on the school lawn he was in charge of caring for. To learn more about which crops you should always buy organic based on pesticide levels, there is a great resource created annually by EWG, a nonprofit organization that advocates for policies that protect global and individual health. The EWG Shopper’s “Guide to Pesticides in Produce” ranks the pesticides levels in 47 different fruits and vegetables. Talk about leaving a bad taste in your mouth! Speaking of which…. Organic food tastes better! At some point in your life, you’ve likely compared strawberries from the grocer to those fresh from the garden. Even without considering that toxic tidbit above, which would you honestly say tasted better? Odds are it was the berry from the garden. When plants are grown without pesticides, their taste is naturally improved. The higher antioxidant levels found in organic foods also impacts how we detect flavour through organoleptic qualities such as taste, aroma, and mouth-feel. Plus, organic foods carry the distinct flavours of a region’s soil, which further enhances their natural taste. When we look at the long-term effect of toxins in our system, we see an increase in autoimmune disease, hormonal imbalances, and nutrient deficiencies that lead to more significant health issues. In Naturopathic Medicine, we seek to remove factors that are preventing the body from healing itself, and in most cases, that includes enhancing the body’s own ability to eliminate toxins. The more we know about how pesticides and other chemicals harm us, the more we can stay away from things that are not serving our longevity, our daily health and the health of our families. They say you get what you pay for, and that statement holds true with organic foods. Buying organic might cost a bit more, but consider it an investment towards improved health, greater flavour, and more sustainability! Maybe you can’t afford to buy all organic all the time – most people can’t. But that doesn’t mean it needs to be all or nothing. Perhaps when you need some of the produce that is on the EWG’s Dirty Dozen list, consider buying organic. Throw a few organic items into your cart now and then, or better still, make friends with the farmers at your local market. As with anything in life, small actions add up to make a real difference. So yes, organic food is worth it! If you have other questions about nutrition or natural ways to improve your health, detoxification from environmental pesticides or other chemicals, please feel free to contact me. I would be happy to help. Just give us a call at 905-852-7969 or email [email protected] I would love to hear from you.